If you’re getting into PHP, WordPress, big data management or MySQL/MSSQL administration then you’ll need to understand SQL. But free tutorials don’t always offer the clearest path for a beginner. They also don’t delve into greater detail on more advanced topics. This is where books are great because they’re much more detailed and copyedited by professionals. In this post I’ll cover a wide array of SQL books from absolute beginner books to more intermediate and advanced guides. Regardless of your experience level(or lack thereof) you should find at least one resource in this list to improve your SQL knowledge. If you’re brand new to SQL and databases then SQL Queries for Mere Mortals is the best book you can get. It has over 800 pages crammed with solid info for non-technical readers. You’ll learn the fundamentals of SQL syntax, many of the common database engines, and how databases actually work from the ground-up. You can start this book with no prior knowledge at all, but it is pretty dense so it might take a while to finish! I’ve flipped through a lot of quickstart guides but this one takes the cake. 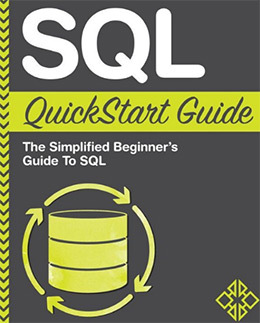 SQL QuickStart Guide is only 76 pages long but covers all those pesky questions that beginners usually have. You’ll then build upon this question learning how to write a proper SQL query for the action. This hands-on learning technique is the best way to retain the knowledge you study. Note this book is tiny so don’t expect to become a SQL expert. 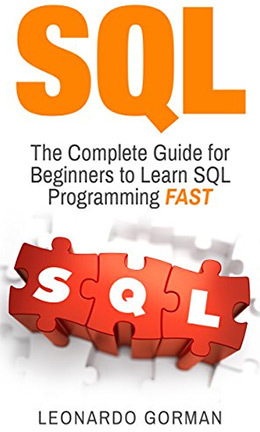 But if you’re a complete novice who needs a quick dip into SQL then this is the book for you. For the amount of detail in this book I’m surprised at how cheap it sells for. SQL: The Ultimate Beginners Guide teaches through very specific examples. Each chapter covers a different concept starting with the basics like creating & dropping tables. As you move further you’ll learn more complex features like the WHERE clause, AND/OR values, and using wildcards in your queries. This book does not teach a backend or shortcut to SQL management. It is a primer on SQL coding made for programmers who want to write their own queries from scratch. I’d recommend this book to developers who want to use SQL in their code, but don’t necessarily need to master the language. You’ll learn more than enough to build web applications but you won’t get into optimization or any advanced topics. The writing style is also easy to follow so this guide can be the perfect intro for anyone, even devs with no prior DB experience. There are a few things I love about this book. It works great as a beginner’s guide and once you’re done it works well as a reference guide. It’s also one of the most recent publications in this list. 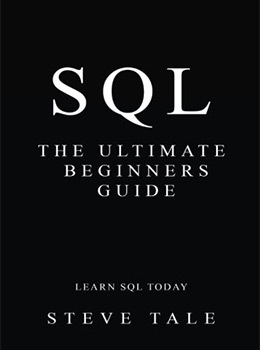 SQL: The Ultimate Guide From Beginner To Expert is fairly short with only 250 pages. But in that space it offers a wide array of SQL basics and more advanced concepts. You’ll learn about common SQL queries along with data functions and tips for architecting a relational database from scratch. The majority of this book’s content falls into scalar functions & data functions. Early lessons move quickly so it helps to have at least some familiarity with SQL. But this book can work well as an intro guide to the world of SQL development. The author explains best practices for database creation and techniques for optimizing SQL queries. This is not a cover-all title but it can take you from a beginner to a fairly experienced professional if you put in the time. Sams Teach Yourself has some of the best books on programming & technology. 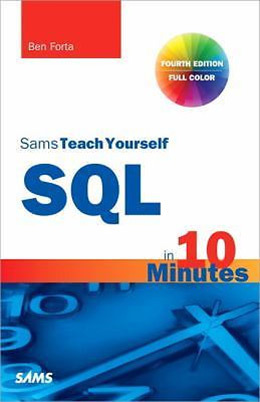 Their book SQL in 10 Minutes is currently in its 4th edition with almost 300 pages. 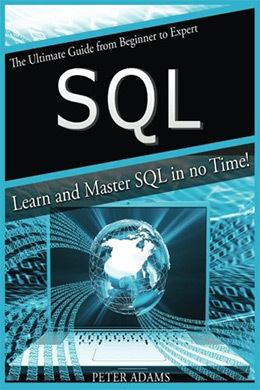 The title is an obvious misnomer because you will not truly learn SQL in just 10 minutes. But it’s not a disingenuous title either because the lessons really can help you learn fast. The author Ben Forta has over 20+ years experience working in IT and currently works with Adobe as a tech evangelist. Ben’s writing style is clear, easy to follow, and works well for beginners. He covers all the most common SQL statements along with “tech lingo” that you’ll need to know. The book is a decent size but not too thick or intimidating for a beginner. You can have absolutely zero knowledge of SQL or databases and still learn from this book. The writing style is made for beginners and by the end you’ll feel a lot more confident working with SQL in any context. Learning to code can be tough but it’s not always the language itself. Some devs struggle to understand the concepts & best practices along with the actual language. That’s where SQL for Beginners can help. It’s a short book with only 88 pages but it covers SQL in so much detail that you’ll be surprised how much you can learn. Naturally this is targeted for complete newbies and it’s merely a fast starting guide. You won’t walk away with expertise in writing SQL queries. But you will understand how queries work and how to write some basic CRUD queries. But this book is so great because it teaches best practices and explains why you should write queries a certain way. An excellent guide for newcomers who have no SQL experience but wanna get moving fast. 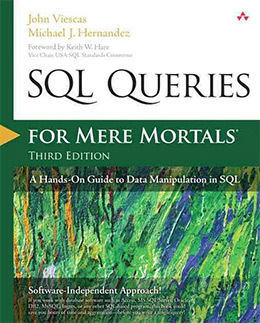 Currently in its 3rd edition, SQL Queries for Mere Mortals is perhaps one of the best theory+practice books on the market. It totals almost 800 pages full of detailed lessons, exercises, and theoretical discussions aimed to increase your knowledge of SQL queries. The goal of this book is to help readers understand how SQL queries operate, how they can be optimized, and how to pick the right statements/expressions for the task at hand. Early chapters start from the very beginning explaining what relational databases are & how they’re used. You’ll quickly move through the basics of SQL getting into more advanced queries with NOT/AND conditionals. Each lesson covers a new technique and builds upon previous lessons. And this book is database agnostic so you’re not forced to use any specific DB engine. Beginners and even semi-intermediate SQL coders will gain a very well-rounded understanding of SQL with this book. It has some of the clearest writing and teaching methods to help anyone build a foundational knowledge of SQL. This is one of those books that fits right in the middle. It doesn’t specifically excel as being a beginner’s book or an advanced book. 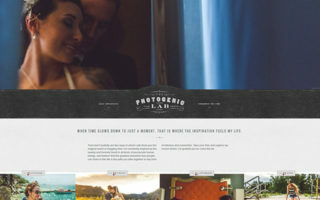 It seems perfect for semi-experienced users who know the basics but want to move further. In Learning SQL you’ll go through 340 pages of lessons covering major database engines like MySQL, MSSQL, and Oracle. This means you’ll be learning the SQL language along with the overall database structure. Early chapters cover the basic data statements and modifiers to set/retrieve data. You’ll learn all about DB administration and the concept of subqueries. The book does start slow in an attempt to keep beginners on board, then quickly ramps up difficulty. The chapters split into separate lessons which each cover a specific aspect of SQL. You’ll learn all the basics through these lessons and quite a bit more. Granted this can be a nice book for beginners but it doesn’t excel in that area. I’d recommend this to anyone who has a basic understanding of SQL who now wants to apply that knowledge to real-world database engines. 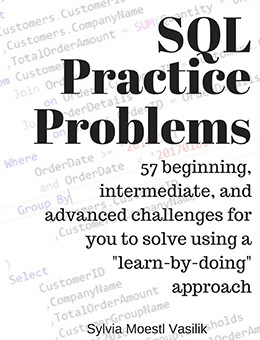 SQL Practice Problems delivers exactly what the title says. It’s awesome for anyone whether you’re applying for a job or just want to master SQL through practice. This is a fairly new publication so it takes a unique angle on teaching. Over 120 pages you’ll work through almost 60 challenges and scenarios involving SQL queries and DB administration. This book uses the free MSSQL Express and teaches you how to setup a new instance on your machine. The problems range from easy beginner stuff like basic insert queries up to more advanced searches and relational database structures. Each lesson walks you through the process step-by-step so you can either try to solve the problems on your own, or follow the book’s guidance. DB admin/DevOps interviews will often have questions related to SQL management so this book can help you prepare. But it works just as well as a study guide for anyone learning SQL on their own. 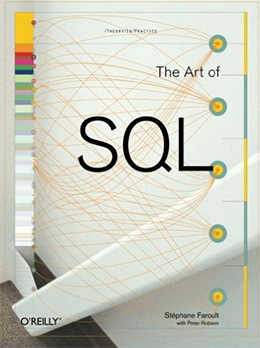 When it comes to top-level SQL books there is nothing greater than The Art of SQL. It’s aimed towards intermediate-to-advanced SQL users who already know the basics but want to improve their technique and workflow. 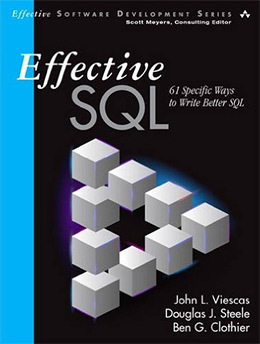 The book spans 372 pages full of best practices, theories, and small essays expressing great ideas for SQL management and reproachful disdain for poor SQL practices. This is a book of strategy. It aims to teach you how and why to do something. Or more specifically, it aims to teach you how to think for yourself about how and why to do something. SQL is a massive language and it powers a great majority of active databases. The author Stéphane Faroult clearly has a zen-like mastery of the subject and his writings in The Art of SQL will make you really think hard about your typical workflows & database structures. If you already have SQL experience and want to push beyond your current limitations then you’ll definitely want this on your bookshelf. Excel is a powerful program used in almost every field. In the book Data Analysis Using SQL and Excel you’ll learn how to combine SQL queries into data mining & big data operations. Each chapter is packed full of examples and theoretical questions to help you understand why you’re crafting certain queries. Data science is a rapidly growing field and there’s a need for skilled database admins who know this stuff. What I like most about this book is that it targets the right audience. Business analysts, data scientists, and big data admins can all benefit from these exercises. Note this is a massive book with just under 800 pages and dozens of chapters. It is the exhaustive resource on SQL+Excel for any type of data analysis operations. You should have some experience with SQL before picking up this book, although you can get by on minimal knowledge if you’re willing to Google to solve problems. Real world SQL problems tend to be much more complex than book examples. But Effective SQL looks into the root of SQL to see how coders maintain their projects and scale SQL databases from scratch. This is an incredible book for intermediate-to-advanced developers or DB admins who want real-world exercises for learning SQL. The book contains 61 best practices and workflows that you can follow to drastically improve the quality and speed of your SQL queries. The authors do cover a lot of syntax tips but they go further discussing database architecture and metadata. 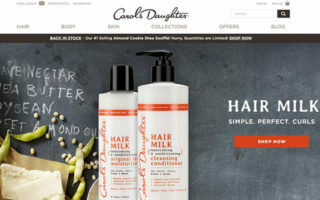 Chapters delve into API development and pulling external data from other websites. You’ll also learn about practical subqueries and how to model hierarchical data properly. I’d recommend this book as a 2nd resource after you already pick up the fundamentals. You could start with a beginner’s book like SQL in 10 Minutes and then seamlessly move onto Effective SQL. Desk references are still big in IT/tech fields and databases are a very popular topic to consider. 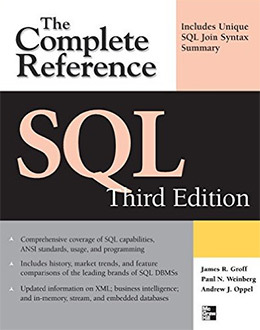 SQL: The Complete Reference covers over 900 pages of SQL tips, tricks, and code samples. The index is fantastic which you’d expect from a compendium of this size. And this book covers absolutely everything you could possibly need(plus quite a bit more). Chapters break down into sections like querying data and programming SQL. You’ll learn all kinds of tricks like multitable queries, DDL statements, custom APIs, and security features for user authentication. You can easily look up any topic in the reference and likely find a related chapter covering that topic. I do not recommend this book for beginners because it’s just too dense. It’s much more useful for intermediate or advanced users who already know what they’re trying to build, but they might not know how to do it. Either way this is the absolute best desk reference out there for SQL database work. It’s not really a code cookbook, but it can feel like one and it operates in a similar manner. 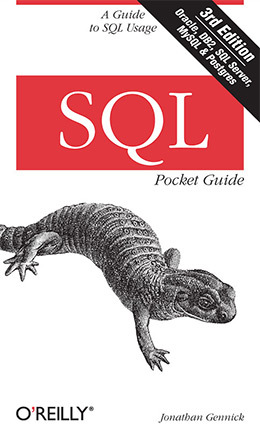 If you’re looking for a much smaller reference consider picking up a copy of the SQL Pocket Guide currently in its 3rd edition. It’s a fairly thin book with 200 pages measuring about half a foot tall. This may not fit squarely in your pocket but it is easy to carry around or keep near your workstation. It’s meant for everyone from programmers to database administrators who frequently need to look up solutions to common SQL problems. Every example in the book is based on a real database table. O’Reilly has the DB tables available for download so if you grab a copy of this book you’ll have access to the source codes as well. This truly is a great reference for anyone working with SQL. It may not be the best intro guide but it can certainly get a lot of use at work or on personal projects. When applications grow they tend to have bottlenecks where the database or server can’t handle the load. This is why SQL optimization is so important and SQL Performance Explained is the best book on this subject. It’s entirely database agnostic so the SQL solutions in this book can work on any platform. Specific chapters cover different topics and each exercise breaks down the SQL query to explain each piece. You’ll learn how to optimize indexing, LIKE queries, join operations, and how to work with object-relational mapping tools. The author Markus Winand also shares his thoughts on scalability and potential pitfalls that new developers make. 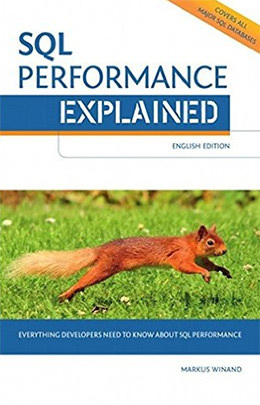 This book is perfect for someone who knows enough about SQL to build apps, but not enough to make them optimized for performance. Any new developer can make a simple app but it probably won’t be very efficient. That’s why SQL Performance Explained is so valuable for newer devs who want to build lightning fast webapps over SQL databases. You can learn a lot by studying the common mistakes to avoid while coding. 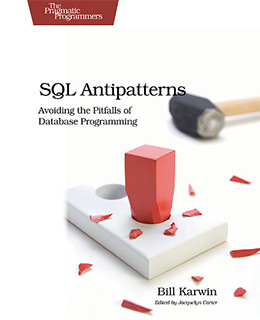 SQL Antipatterns is the definitive guide to common pitfalls and screw ups made by newer web developers and DB admins. The book is a few years old but SQL doesn’t change that much, and neither do the most common problems(they’re common for a reason). You’ll get 300+ pages full of problems with solutions and tips to avoid them in your own work. The author Bill Karwin has an excellent way with writing each chapter. He explains one problem at a time going into great detail to pinpoint the cause. From there he covers the “antipattern” or best solution that can be applied to all projects. Bill also defends his solutions with logic and decades of experience working in the IT industry. He’s seen it all and he uses that experience in this book to help readers learn. 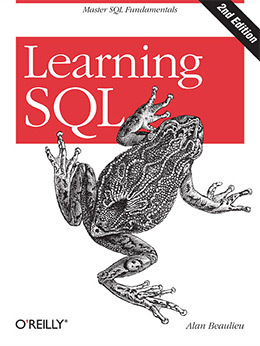 You can pick up this book at any skill level but it helps to be comfortable with SQL syntax. Beginners are likely to learn the most from these lessons because they’re aimed at green devs who haven’t learned this stuff yet. 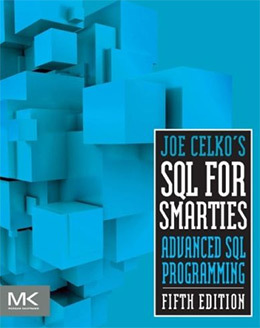 Currently in its 5th edition is Joe Celko’s SQL for Smarties, a primer on more advanced SQL development. This is one of the few books created solely for advanced programmers who want to push the boundaries of their SQL knowledge. This book has been around for well over a decade and the newest update was published in 2014. It comes with over 850 pages of exercises and lessons based on common SQL situations. Joe shares tips and best practices for each scenario explaining how to properly solve the problem and why it’s the best solution. You’ll learn about new syntax techniques but also get into database administration concepts like relational division and partitions in queries. If you grab a copy of this book you’ll also get all the source code for free along with downloadable data sets for testing the exercises locally. This is by far the most comprehensive pro-level SQL book on the market and it’s sure to take your skills up a notch. It’s hard to state exactly what sort of experience level you need for this. But I’ll generalize and say that if most of the other books in this list seem too easy or convoluted then Joe’s SQL for Smarties might be a perfect fit. There is no better intro guide to the MySQL platform than this book. You get 300+ pages full of exercises and examples showing how MySQL works and why it’s such a popular database. 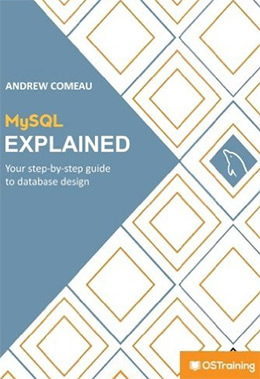 MySQL Explained is ultimately a step-by-step guide to MySQL. 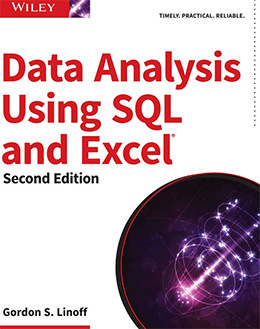 It does use plenty of SQL syntax but the real goal of this book is to familiarize the reader with general database theory. I actually recommend this to any web developer who wants to move into backend development because the writing is so clear and detailed. You don’t even need to know much(or any) SQL to get by. It certainly helps, but this book was made for non-techies who need to understand relational databases. The early chapters literally define what a database is and how it functions. Can’t get more basic than that! MySQL is also one of the top 3 databases in use worldwide and it’s an open source platform so it’s a great tool to study for database theory. This book is absolutely perfect for anyone who needs a more rounded understanding of databases in action. The writing style is easy to follow and the guided nature of the book takes you along from one page to the next. 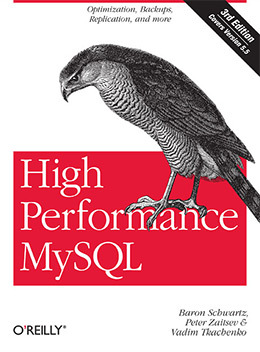 If you’re frequently working with MySQL and need to optimize your DB environment grab a copy of High Performance MySQL. It’s a massive book totaling just over 800 pages full of techniques, tutorials, and best practices for scaling a MySQL database. Topics include custom schemas, indexes, and of course SQL queries optimized for performance. This book is currently in its 3rd edition with tons of updated content for MySQL 5.7 and further improvements with the InnoDB storage system. You’ll learn how to replicate databases, automate certain tasks, deploy a cloud-based MySQL engine, and how to execute DB queries over multi-core processors. If you consider yourself a professional web developer then you have to read this book. It’s geared towards server admins & backend developers who want to digest and master everything about MySQL optimization. Cookbooks are valuable resources that offer pre-defined solutions to common problems. O’Reilly’s SQL Cookbook delivers this in spades with over 600 pages packed with dozens of custom SQL solutions. This book is best used as a desk reference for advanced users, or as a study guide for intermediate users. The contents range from simple to very complex. You can learn a lot by studying the recipes but you need to understand the basics of SQL first. Each scenario follows the structure of problem -> solution -> theory. The authors present a scenario, offer the best solution, then explain why it works and why it’s the best choice for the problem. You’ll learn how to work with real data across many different database engines including MySQL, Oracle, and PostgreSQL. I absolutely must recommend this book to any serious DB admin or backend developer. It’s even better than a reference guide because it actually provides powerful solutions that you can implement and study. And this book will be relevant for years to come making it a great investment for semi-experienced developers new to database programming. 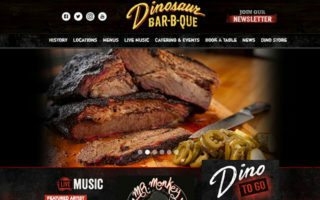 Here’s another magnificent cookbook focused more on the MySQL engine. 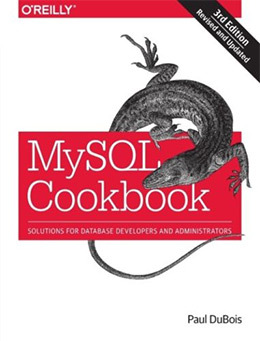 With the MySQL Cookbook you get 866 pages filled with over 200 recipes to help you solve problems from SQL queries to server bottlenecks. The book has been fully updated to support MySQL 5.6 and 5.7 with solutions for storing data, reformatting content, and importing/exporting via automation. You’ll also learn how to work with session management and how to manipulate different MySQL storage types. 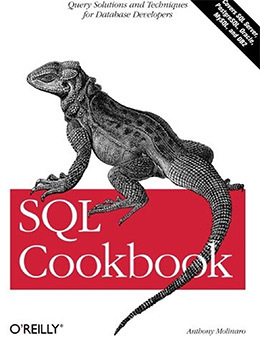 You should already have some SQL knowledge before grabbing this cookbook. However it can work surprisingly well as a guide to the world of MySQL for beginners. If you already understand how database engines work then you can pick up a lot of cool tricks from this cookbook. 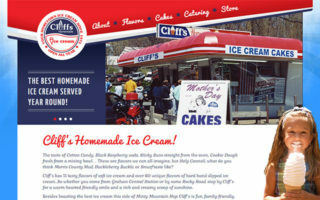 The recipes are super detailed and each solution is followed by an intricate explanation. Beginners to advanced users alike can learn a lot from this cookbook. And it’s another resource that seems forever young and consistently valuable with each passing year. If you’re brand new to databases looking to dive right into SQL then SQL Queries for Mere Mortals is your best bet. It covers literally everything you need to know including the basics of how relational databases work. If you need more of a “quick dive” into SQL then check out SQL in 10 Minutes, part of the Sams Teach Yourself series. Intermediate-level SQL devs might appreciate more detailed exercises with relational theory like in SQL Antipatterns. This book pairs very well with SQL Practice Problems which pushes you to solve and learn through real examples. And if you’re more of a pro developer looking to truly master SQL then The Art of SQL is a must-have item. It is practically the zen of everything database and SQL related. Or if you need a more actionable resource for your dev projects then SQL Cookbook could prove useful. Every book in this list targets a different purpose and intended audience so it’s tough to recommend one “best” title. 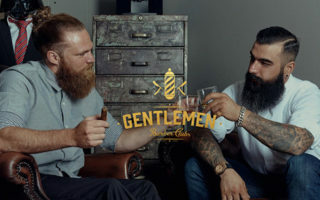 Take another look over this post and skim through all the titles. 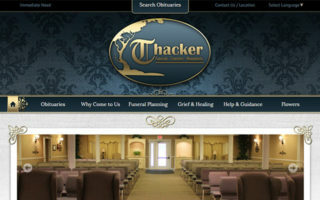 If anything looks like it could help you out be sure to take a peek and see what you think.